Ashley Z. Hand, AIA, LEED AP BD+C is co-founder of the smart city advisory company CityFi. Previously, Ashley served as the Transportation Technology Strategist for the City of Los Angeles Department of Transportation. As a fellow, she developed and is now implementing public policy, an action plan and pilot program recommendations for transportation happiness, shared mobility, automated vehicles and other technologies. Prior to her role with the City of Los Angeles, Ashley served as the first Chief Innovation Officer for the City of Kansas City, Missouri where she created the nation’s most comprehensive smart city to date through a public-private partnership that utilizes large companies and nimble start- ups to fulfill the city’s goals, and initiated the development of a policy and operational framework to integrate technology into transportation, water, and energy management for the city among other civic innovation projects. Ashley is a registered architect and green building professional and previously worked with AECOM on sustainability, planning, and design projects across North America. She serves on the Advisory Council for the Carnegie Mellon University Traffic21/T-SET University Transportation Center and Open Architecture Collaborative and is an adjunct professor at the University of Southern California Price School of Public Policy. Transportation technology is evolving at an exponential rate and, for the first time since the advent of the automobile itself, we have a unique opportunity to completely rethink our cities as they are shaped by transportation networks. With the advent of autonomous vehicle (AV) technologies, and the proliferation of shared mobility, there has never been a moment as critical as now to envision the city of the future. With more than two-thirds of American adults having access to smartphones and the ubiquitous connectivity of Wi-Fi and broadband services, new transportation service delivery models and mobility marketplaces have emerged, challenging the status quo while offering new alternatives to consumers. Shared mobility — which enables users to gain short-term access to transportation modes as-needed — has introduced new transportation choices into the market. Transportation network companies such as Uber and Lyft are merely two of the many such platforms that challenge the status quo while services like carshare, bikeshare and scooter sharing are being introduced in market. 1. We can reclaim one of our largest public assets to create higher value, better quality streets designed to move people, not just vehicles. The calming of vehicular traffic and investing in infrastructure that supports public transit and active transportation are creating new economic opportunity and vitality on our city streets. In Salt Lake City, for instance, early research indicates that the rebalancing of the public streets in its main commercial corridor by eliminating parking and adding bike facilities has actually spurred greater spending and revenue for local businesses as customers who walk or bike to the district tend to spend more time (and therefore more money) at these businesses than customers who would previously drive to the district. While local governments adopt better street design guidelines, the private sector should support and advocate these investments as an opportunity to improve the desirability of existing and future developments. 2. We can rethink our streetscape and building design for better access for all. Many buildings and developments have increasingly turned their back on the public right-of-way to face and serve tenants and visitors who are entering from a parking garage or parking lot. Large setbacks behind surface lots make these developments unapproachable and even unsafe for pedestrians and transit riders accessing main entrances on foot from the street by requiring them to cross large spans of parking. Even in areas with little to no setback, commercial properties have often closed building entrances facing the sidewalk in favor of controlled access from a more parking-centric entrance. Along Wilshire Boulevard in Los Angeles, for example, even historic building entrances have been shuttered with the new primary entrance positioned at the back of the building — from the parking lot. Cities must require through zoning and/or other design guidelines that our buildings and streetscapes serve to activate the public realm with people, including the growing population of shared mobility users who are being dropped off. Developers must prioritize and designers must advocate for buildings that serve active transportation access and other alternatives to the single occupancy vehicle, especially when considering an autonomous future. 3. We can eliminate parking lots and structures for higher and better uses than vehicle storage. Here are three troubling statistics for consideration: the County of Los Angeles has an estimated 200 square miles of parking;3 there are roughly six parking spots per vehicle in the United States; and the average vehicle is parked approximately 95 percent of the time.4 Through a combination of AV, car sharing and right-sizing car ownership, it is estimated that up to 85 percent of automobiles in cities can be eliminated with a significant impact on congestion and creating a sea change for the auto industry.5 By creating a culture of shared mobility today and working efficiently to adapt our digital and physical infrastructure to support AV in the future, cities can redefine the use of its public right-of-way and alleviate pressures on the built environment that currently support single occupancy vehicles and their onerous parking requirements. We can reclaim this land given to the automobile for public open space, public safety, programming and higher density development. Policies and regulations are based on the technologies of the past, defined by the information that decision-makers had at the time. Rules for parking are generally based on building use and square footage with little consideration for location or proximity to public transit. This approach is outdated and fails to address additional variables that impact personal choices and behavior. The “Right Size Parking” project in King County (Seattle, Wash.) found that block size, population and job density, and walk and transit access to trip destinations influence parking utilization, in some cases by as much as 50 percent.6 Since developers cannot factor these considerations into their project plans, costly and often underused parking spots are added to the inventory. Adopting a parking calculator tool similar to the King County Right Size Parking Calculator, defining parking requirements in terms of parking maximums and not minimums, and offering incentives for developers who accommodate more shared modes onsite such as bikesharing and carpooling would not only help the bottom line of projects (making the cost per square foot of leasable space more competitive) but help reduce congestion. Cities must also rethink the entitlement process, and train its staff in urban design best practices that focus on people, not storing cars. While some have advocated for the complete cessation on the construction of any new parking in the United States, a phased approach to implementing these changes could start with commercial developers who voluntarily accommodate multiple modes in exchange for reduced parking requirements or identifying overlays in transit-rich parts of the city. If located near existing transportation hubs, developers should be encouraged to create a travel demand management program to understand impacts and define a comprehensive approach to balancing all of the different ways people may access their building — whether on foot, bicycle, bus or shared vehicle. Travel demand management measures could include carpooling, vanpooling, subsidized or bulk-rate transit passes, on-site carshare service and parking, guaranteed rides home, telecommuting, unbundled parking, parking cash-out, education and program support, emergency transportation, transit shuttles and bicycle commuter facilities.7 Savvy developers and cities could also change parking design standards to allow for such structures to be easily converted in the future. 4. We can optimize the accessibility of our communities through better land use strategies. Affordable transit-oriented development can improve communities by making it easier for people to choose transportation options near where they live and work. First and foremost, development should strive to reduce the burden of transportation on household budgets — the second highest monthly expense. Better connecting goods, services and people can help economic expansion and growth. Development should be scaled to and centered on accommodating multiple modes, including automobile and transit networks as well as pedestrian, cycling and eventually automated vehicle networks. Transportation and land use are inseparable and current methods for evaluating transportation services do not account for the productivity of land use or overall market productivity — rather they rely on delay-based metrics. Integrating these considerations can help cities deliver better planning and services. 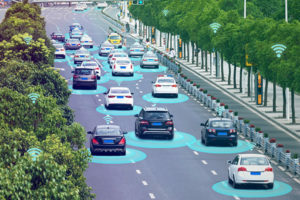 Furthermore, today’s technologies help meet people’s demand in real-time, reducing the impact of mobility on our environment and society through greater efficiency. Urban design can amplify benefits and increase options for people. Density and diversity of such development should strive to connect with mobility options. Higher density, walkable neighborhoods, with fewer parking options, tend to create the conditions for people to test alternatives to driving alone.9 Cities must embrace the potential of this evolving marketplace while maintaining focus on providing equitable access to safe services. Twenty-eight percent of car trips are a mile or less according to the Governors Highway Safety Association.10 Shared mobility can encourage greater use of transit by providing much-needed connections for the first-last mile of trips. It is important, however, to consider these services as part of a system or marketplace of solutions. Riders are going to choose the mode that best meets their needs and priorities whether it is schedule, proximity to service, cost of the trip, environmental impact or even health benefits. Providing flexibility to choose the right mode requires supportive public policy and collaboration. AV and shared mobility are introducing exciting possibilities for cities and can revolutionize how we use the public realm. As cities grow, however, more of the same dependency on the single occupancy vehicle will bring traffic to a standstill. The public and private sector must work together today to shape a future of urban mobility that contributes to goals for livability, sustainability and access to economic opportunity.